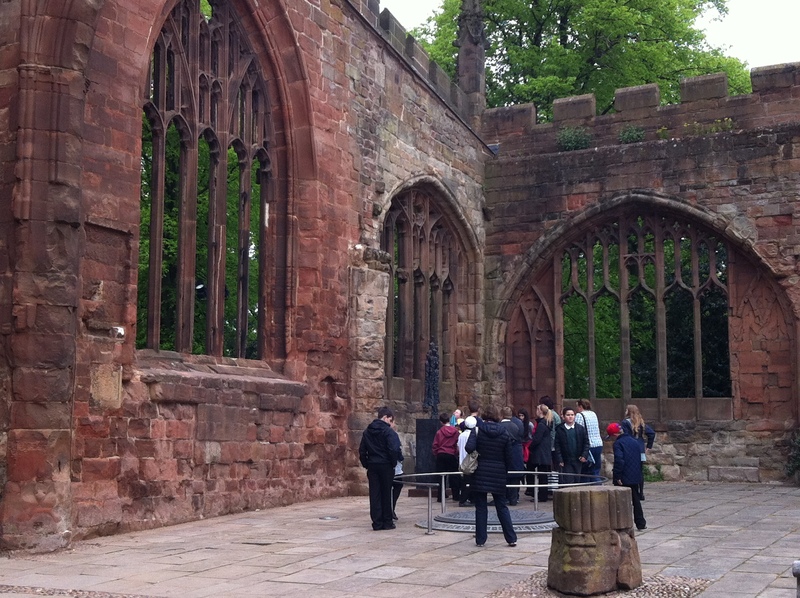 So I have this couple of brave and crazy friends, who are locking themselves in a cage in the beautiful Coventry Cathedral ruins for a week, in order to talk to people about what freedom means. We went to visit them. They’d just started when we dropped in, and were so far pretty warm and dry. Someone had bought them coffees; they were enjoying chatting to strangers. It was uneventful that day, but I wonder how the rest of their week’s been. I always forget how lovely the Cathedral ruins are; they’ve been turned into a kind of sculpture park. 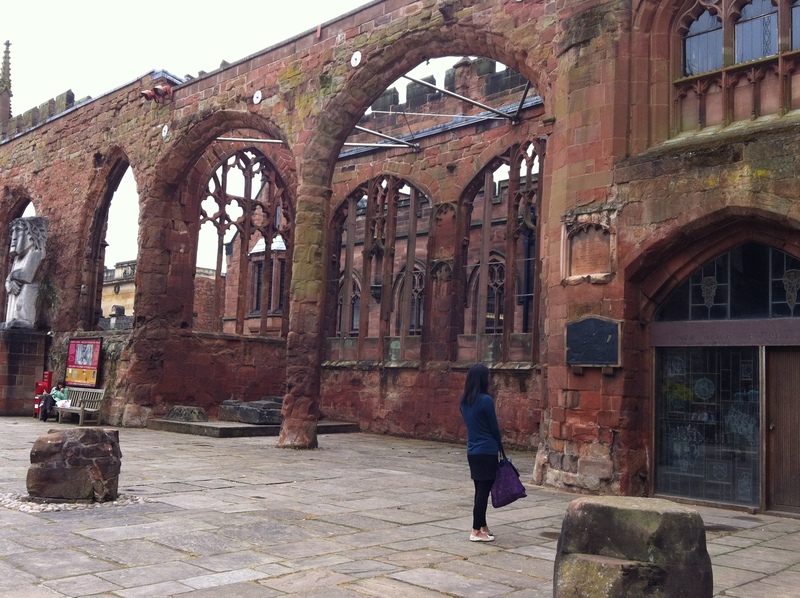 The city of Coventry was basically flattened by bombing in World War II, and the shell of the old Cathedral is one of the structures that has been preserved and refashioned into something beautiful. It’s such a good place for being still and quiet in. That last sculpture above is possibly my favourite in the whole entire world. It’s titled reconciliation, and another copy is in the Hiroshima Peace Park in Japan. It makes me think of love, real companion-friendship love, and humility. 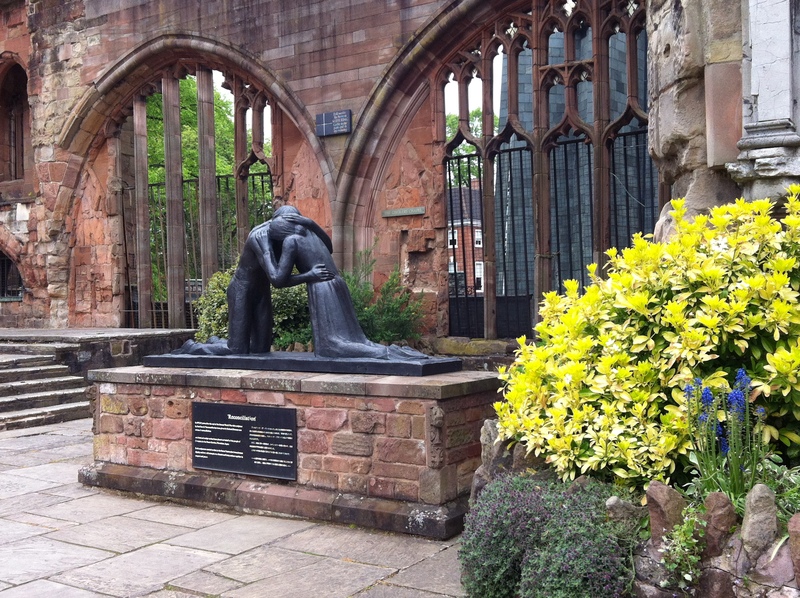 This is one of the things that I love best about Coventry: that it is a city of peace and reconciliation. A city that said in the wake of destruction that it would forgive. So I think I’m going to leave you, not with lots of words or knowledge or faith or radical acts, but mindful of love that humbly transcends all these things.